An Area of Outstanding Natural Beauty: Possibly one of the most beautiful parts of the world, the Cotswolds is a rural area of south central England with distinctive rolling hills and instantly recognisable yellow limestone. It was only a matter of time before we wanted to design a pretty Top of the World to celebrate this wonderful part of the country. Let your loved ones know you wish they were here. The Cotswolds: ﻿The centrepiece of this lovely card is our local Old Post Office in Guiting Power. It also includes the Church in our village, a glimpse of the cyclists in Bourton on the Water, and a view of Arlington Row in Bibury. The Cotswolds is so much more, but this is a little taste of our local beauty. A greetings card that's truly a gift and an AONB in an envelope! just received it yesterday , was a little late in arriving but loved it never disappointed in your product! I have placed repeated orders with this company as the range of pop up cards is unique and top quality. The attention to detail is amazing and the card is a present in itself. Excellent service too. 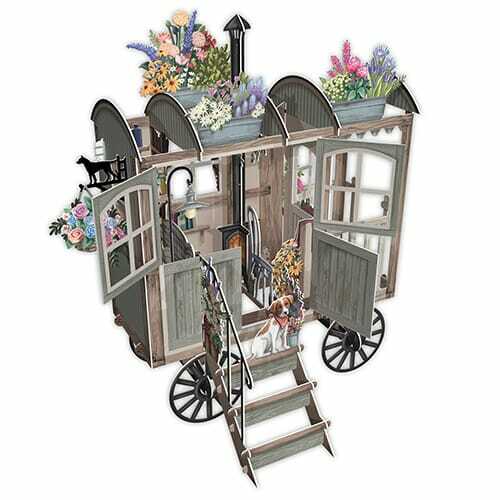 Fabulous card,the details are superb,bought the shepherds hut and the cottage for my husband's birthday he loves them, they are now sitting on his desktop.